In its major eruption 1.14 million years ago, the Valles Caldera volcano spewed out over 300 cubic kilometers of ash, mostly as the Bandelier tuff (tuff being a rock composed of volcanic ash). The Bandelier is an ash-flow tuff, meaning that it flowed from the volcano as a hot slurry of ash particles and gas (~500-700°C). This slurry, flowing faster that 100 km/hr, and travelled 25-35 kilometers from its source at the caldera. 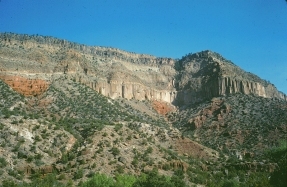 The Bandelier tuff is several hundred meters thick on average, thins to nothing far from the caldera, and is much thicker where it filled canyons. Above and below and beyond the Bandelier are air-fall tuffs, rocks made of volcanic ash that settled down through the air. Air-fall ash from the Valles Caldera eruptions has been recognized as away as Iowa. Mesas and Caldera. 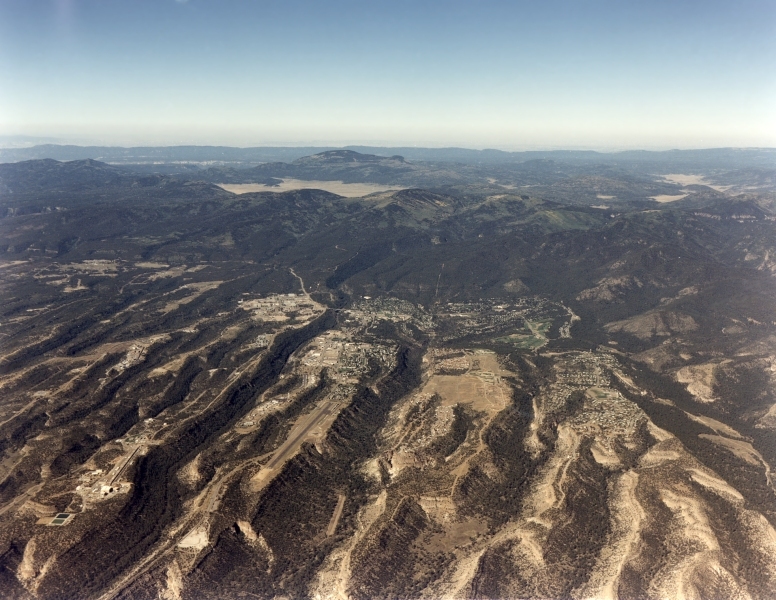 The long mesas in the foreground of this aerial photo are made of Bandelier tuff, erupted from the Valles caldera volcano ~ 1.14 million years ago. 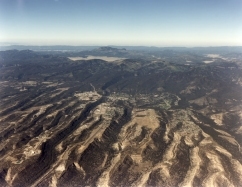 The Valles caldera is in the background with the resurgent dome (Redondo Peak) just left of center. On the Ground. 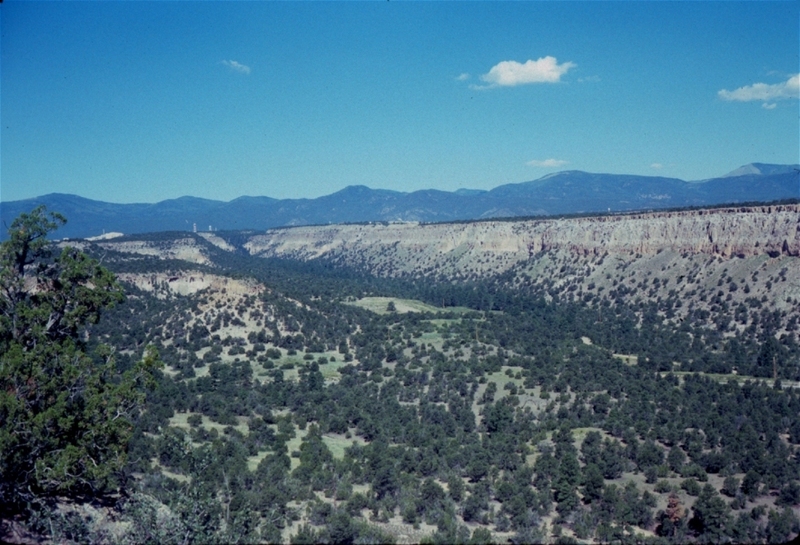 Looking west towards the Los Alamos National Laboratory, up a canyon. 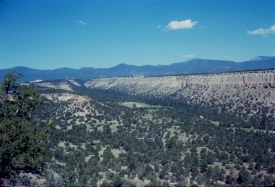 The skyline is the topographic rim of the Valles caldera. 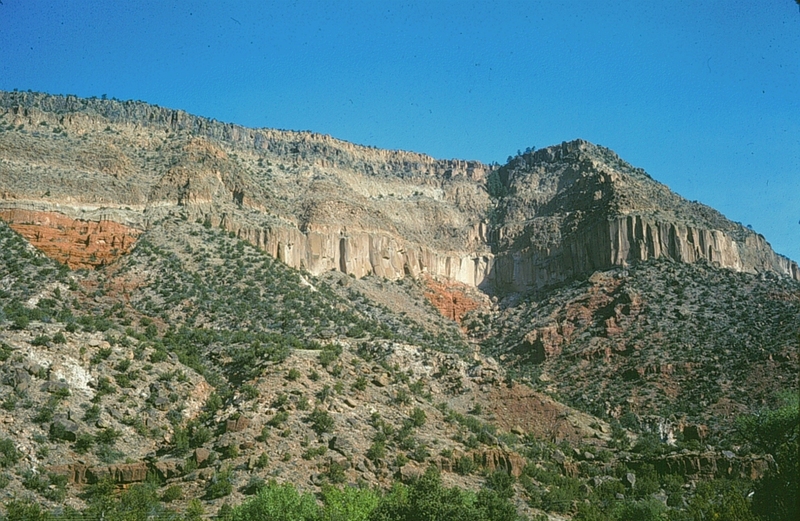 The cliffs on the right are Bandelier Tuff, and the layers represent the two major eruptions of the tuff, and different cooling rates in each tuff deposit. The center of an ash-flow tuff sheet cools slower than the top and bottom, so its fragments of volcanic glass become welded to each other. This rock is massive and strong, unlike the unwelded ash-flows and air-fall tuffs, which can commonly be crumbled by hand. So, the center of an ash-flow tuff holds up cliff tops, and the top and bottom tend to form slopes. The Bandelier Tuff. Rock from the centers of ash-flow tuffs can be very strong, in some cases like obsidian. Above and below the centers, the tuff is flimsy and can be carved or excavated with ease. Weathered tuff is a bit stronger, and this combination of soft insides and harder outsides made it ideal for cave dwellings. 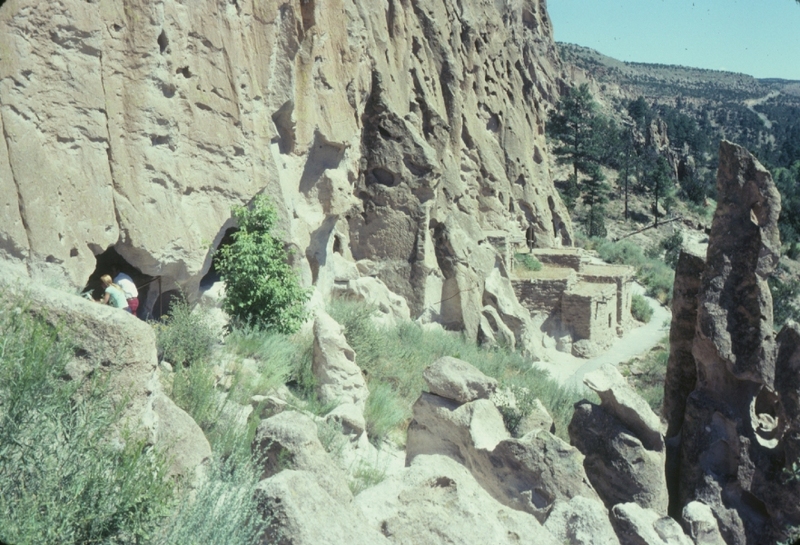 In Bandelier National Monument, near Los Alamos, prehistoric native Americans built their pueblos from bricks of Bandelier Tuff, and dug rooms into canyon walls of the tuff. This photo shows a reconsructed pueblo-style dwelling and cave rooms in Frijoles canyon, near the visitors center of Bandelier National Monument. Bandelier Tuff, Jemez Canyon. The pale rock here is Bandelier tuff, erupted from the Valles Caldera. The cliff-forming layers are the centers of ash-flows, and the slopes are weaker rock from the tops and bottoms. Beneath the Bandelier tuff are red shales and sandstones of the Permian aged Abo formation, and brown limestone of Pennsylvanian age. Some of the white patches on the hillside are hot-spring deposits - with heat courtesy of the Valles volcano. This scene is near Jemez Pueblo and a hot spring (the Soda Dam) comparable to Mammoth Hot Springs but much smaller.